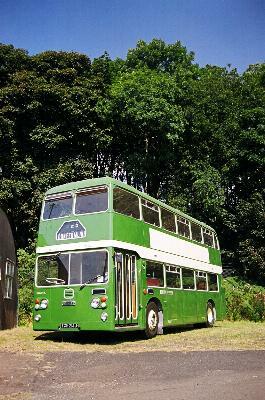 It never rains in Southern California however it always lashes at the Scottish Vintage Bus Museum open day. But not this year. For a welcome change the sun shone, the organisers smiled, the visitors smiled - and some would even say the buses smiled. Somewhat enterprisingly, it was decided to organise the exhibits into some semblance of order rather than have the usual rag-tag displays. 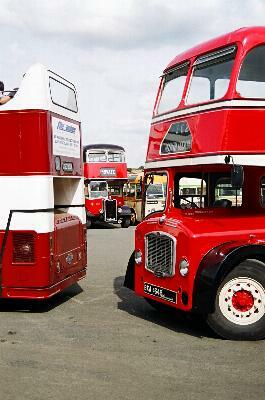 The highlight was the Western SMT display (above) which featured buses and coaches from the 1960's and 1970's. Other line-ups and a selection of vehicles can be seen below. Here comes summer. Above left: What many thought of as the star of the show - Newcastle Corporation AEC Regent 341 (NVK341) performing an internal feeder service. 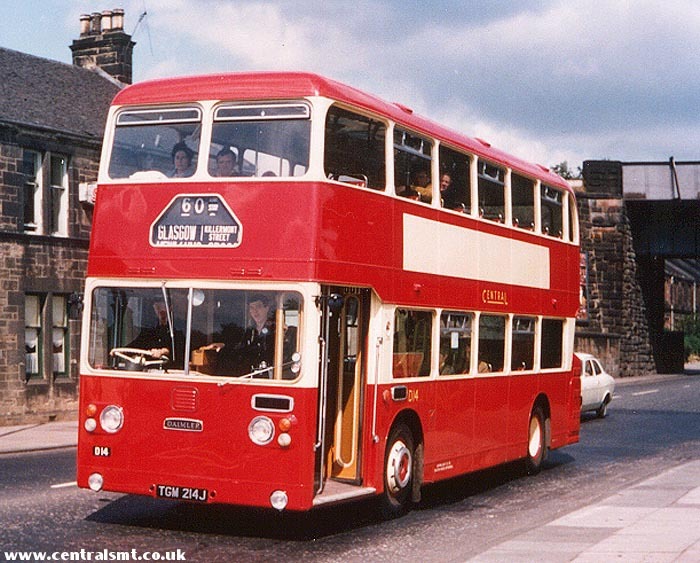 Right top: Glasgow Corporation SGD65 and SGD448. 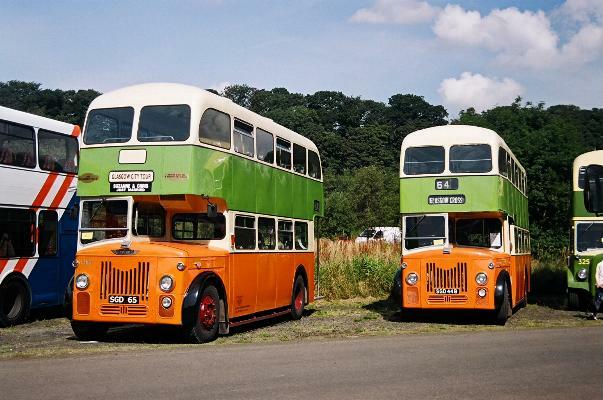 Right lower: Lothian Atlanteans BFS1L and JSC900E. Above left: There were several new exhibits on display this year including another from the gigantic collection of Rod Wallace - Eastern Scottish Fleetline DD294A (TGM214J). Despite coaxing and cajoling from West coast punters, Rod is steadfastly refusing to paint this vehicle into original Central SMT livery. Right top and lower: Eastern Scottish (SMT) and Macbrayne line-ups. A sunny day in Fife. Take note. Above left: The open-top tour to the Forth Bridges proved to be as popular as usual. Lothian Atlantean 900 (JSC900E) and Fife Lodekka BXA464B prepare for departure. Framed behind is McGill's Guy GVD47. 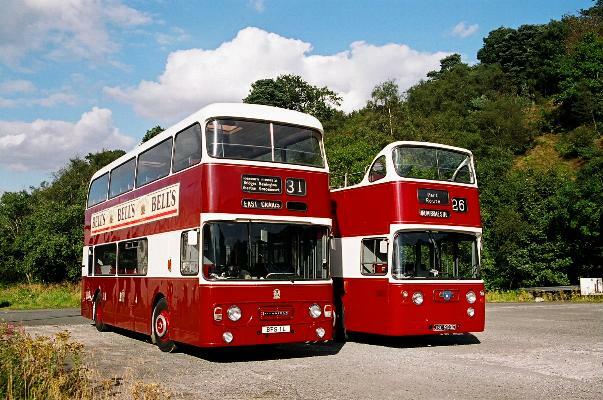 Above right: Gordon Stirling has just recently finished restoring Western Leopard AL2464 (SCS333M) which is seen in the company of sister DL2497 (SCS366M). All photos taken in August 2003. Click to enlarge.